Founded in 1769, Dartmouth College is a member of the Ivy League and consistently ranks among the world's greatest academic institutions. Dartmouth has forged a singular identity for combining its deep commitment to outstanding undergraduate liberal arts and graduate education with distinguished research and scholarship in the Arts & Sciences and its three leading professional schools—the Geisel School of Medicine, Thayer School of Engineering, and the Tuck School of Business. Dartmouth College has scholarships and loans available to international students, which includes an allowance for travel to the U.S. We understand that your circumstances may be unique and our office will help in any way we can. 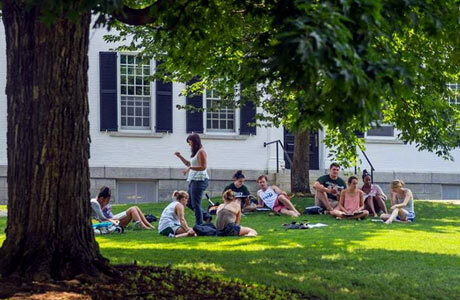 Dartmouth practices need aware admissions for international candidacies. International applicants must apply for and demonstrate financial need at the time of application. More financial aid detail is available for international students within your student aid application path.